The world's best technology for converting PowerPoint to HTML5 and Flash with all animations, transitions, and effects. iSpring's pioneering conversion engine has empowered hundreds of enterprise-level solutions, including iSpring’s own products. 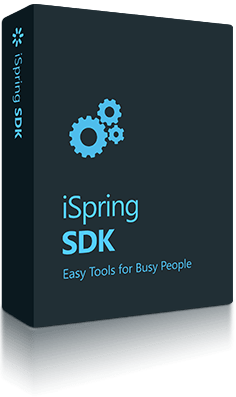 The perfectly engineered iSpring SDK can be easily accessed in C#, C++, Java, Python, PHP, and other Windows technologies. 200+ applications for digital signage, web conferencing, and content management have been using iSpring technology since 2001. You can download and convert it to verify the highest accuracy of iSpring conversion. iSpring SDK seamlessly integrates with web and desktop applications to provide fast and accurate PowerPoint to HTML5/Flash batch conversion. iSpring components provide COM and .NET interfaces for easy access to the conversion engine in C#, C++, Java, Python, PHP, and other modern technologies. This intuitive application generates C#, VB.NET, and command-line code, and lets you quickly evaluate iSpring SDK without programming. The clear and simple command line utility allows you to automatically convert bunches of presentations and develop command line scripts. With iSpring Player components, you can build your own custom branded presentation player. The same components facilitate the advanced players available with iSpring Suite. Use the AS3 API to control Flash presentations in your Rich Media Flash application. iSpring helps to control your presentation playback: start, stop, pause, resume playback, and jump to any link or slide. iSpring components provide all the features needed to build your custom player, even with comprehensive functionality. iSpring API helps you track all user activity. If necessary, you will know about every slide your user viewed and how long they were there. iSpring creates adaptive HTML5 presentations which play on iPad, iPhone, Android, Windows, and Mac. iSpring accurately converts 189 of 199 animations available in PowerPoint 2016. It retains triggers and animations, as well as their sequences, directions, and timings. iSpring supports all 48 transition effects in PowerPoint 2016, including the complex 3D transitions and the Morph effect in PowerPoint 365.
iSpring works with large video and audio. It helps optimize the size and quality of embedded media for fast presentation load times. iSpring precisely retains formatting and positioning for tables, charts, and shapes, as well as their geometry and sharpness, and saves them in vector format. iSpring carefully preserves the original quality of your graphics, and all images stay crystal clear. Alternatively, you can decrease image quality to get ultra compact files. With iSpring, all texts keep their size, position, style, font, color, bullets, and other formatting after conversion to HTML5 and Flash. iSpring supports Arabic, Hebrew, and other right-to-left writing systems, and thoroughly preserves the original characters’ orientations. You can rely on iSpring to keep the interactivity of the original PowerPoint files: all hyperlinks and buttons work as intended on any device. Even the trickiest SmartArt objects keep their appearance and clarity after conversion with iSpring, so that the slides preserve their original functionality and style. to Convert PowerPoint to HTML5 and Flash. Easily enhance your webinars with interactive online presentations. With the Player SDK, hosts and speakers have full control over presentation playback. You can add to your content management or learning management system an extremely convenient option to demonstrate PowerPoint files online. With iSpring SDK, you can create your own desktop application which will convert PPT to both HTML5 and Flash with the highest quality, and the output content can be easily played and controlled inside your mobile app. Since 2001, iSpring has been developing the most precise conversion technologies for converting PowerPoint presentations to online and mobile formats. The world’s best PowerPoint to Flash conversion engine from the vendor with 12 years of experience in PowerPoint to Flash technology. AccuPoint ensures that Flash output files are identical to the original PPTs and retain animations, triggers, transitions, and other effects. The superior PowerPoint to HTML5 conversion technology introduced by iSpring in 2012. HyperPoint converts PPT to online presentations which play perfectly on all platforms: Windows PC, Apple Mac, iPad, iPhone, Android, and Windows Phone. Get a fully-functional 14-day trial of iSpring SDK and try out its powerful PowerPoint to HTML5 and Flash engine with your application.